Aquaculture is conducted in many different forms throughout regional Victoria. Inland aquaculture is subject to a complex array of regulation administered by a range of government agencies. Improving the understanding of aquaculture for applicants and local government within the context of Victoria's planning frameworks was recognised in recommendations made by an Aquaculture Regulatory Reform Taskforce, lead by the former Office of Regulation Reform (ORR) in 1999. 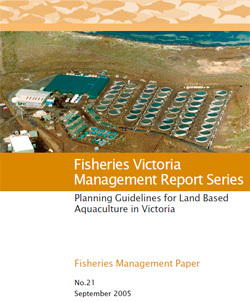 In response to the ORR recommendations the Planning Guidelines for Land Based Aquaculture in Victoria was developed. These Guidelines will assist local government in further understanding aquaculture and how it relates to Victoria's planning provisions. The Guidelines will also assist community stakeholders to better understand the nature of aquaculture systems while providing a balanced assessment of any potential impacts for land based farming systems. In particular, the Guidelines are designed to assist local government planners and other agencies in assessing aquaculture applications. A copy of the Planning Guidelines for Land Based Aquaculture in Victoria is available for download below. If you require further information contact the Aquaculture Unit, The Victorian Fisheries Authority, PO Box 114, Queenscliff 3226 or contact the Customer Service Centre at Ph: 136 186.